A little cosy cottage with all you need for a home-from-home break offering the opportunity to relax and unwind or explore the Essex coastline at a truly competitive price. Three minutes stroll to the award-winning Jaywick Sands beach; this homely cottage is ideal for individuals or couples who like long walks along miles of sandy beaches, turning right along the beach to walk to St Osyth and left to walk through Clacton on Holland on Sea and Walton on Naze. The cottage is deal for travellers with pets due to the secure garden and the all-year-round pet-friendly beach. The cottage has a small double bedroom, a lounge, a back door (into the garden), galley kitchen with cooker, hob and microwave and bathroom with full-sized bath with power-shower over. Children are welcome but please note that the roads are also the pavements and are rough unadopted roads and are not buggy-friendly. 3 minutes stroll to the beach. A quiet get-away at an affordable price. Duvet, bedding and bed linen provided. 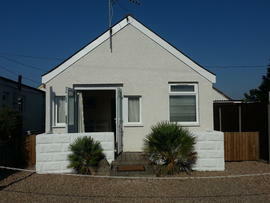 Jaywick Sands is a quiet coastal village boasting award-winning sandy beaches and a five minute drive to Clacton on Sea. 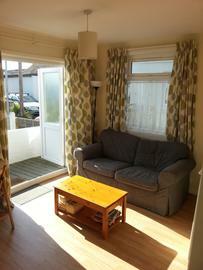 Jaywick Sands beach is dog-friendly all year. Clacton is the largest seaside resort along the Tendring Peninsula and has everything needed for an enjoyable traditional seaside holiday. There are also regular buses from Jaywick to the centre of Clacton's resort area. This is an ideal base for exploring due to its proximity to Colchester, the country's oldest recorded town and Constable Country with its beautiful countryside and villages of Dedham, Flatford and Stratford St Mary. By Car From London From London and the M25, take the A12. Pass the exits to Colchester West and Colchester Central, then join the A120 signposted Harwich (see 'all directions' below). From the Midlands and North Follow the A14 (signposted Felixstowe/Harwich) until you are South of Ipswich. Join the A12 signposted London. After roughly 10 miles, leave the A12 at the exit for Colchester and Harwich (A120). Join the A120 towards Harwich. (see 'all directions' below). From all directions After joining the A120, drive about 4 miles to 1st exit, A133 (signposted Clacton). After 1 mile, you'll reach a roundabout, go straight - continuing to follow the A133. Continue for about 1½ miles to a roundabout with a garage and the Bowling Green Pub/Hotel. Take the 2nd exit (still the A133) to Clacton. After approximately 3 miles you'll reach another roundabout, go straight over and travel another mile until you get to St Johns roundabout. Take the 4th exit, St Johns Road, signposted for Jaywick and St Osyth. Follow this for about 1 mile. On second mini roundabout, take the 1st exit (left) on to Jaywick Lane. Follow for about 1 mile. You will reach a double mini roundabout by a row of shops and the 3 Jays pub. Go straight over on to Golf Green Road. Follow in to Broadway, then in to Tamerisk Way. You will come to a cross roads, go straight over. Sweet Tina's shop will be on your right. After 200 yards you'll get to a mini roundabout, turn right in to Lotus Way. Follow for about ½ mile. Singer Avenue is the 3rd on the right. Beach Cottage is towards the bottom of Singer Avenue, 2nd from the end, number 25. Your car can be parked directly in front of the property. 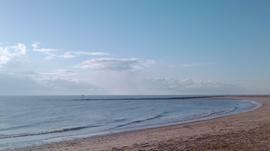 By Coach and Rail: There are coach and rail services in to Clacton on Sea. There is a regular bus service from Clacton on Sea to Jaywick. 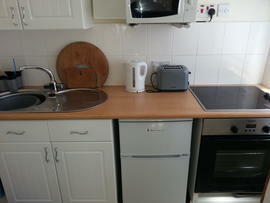 Weekly price from £199 (March and October) to £299 (August) per week. Short breaks are available for all but the peak-weeks. Minimum 2 nights - From £120 for a 2-night short break, £149 for 3-night short break. "Love it fantastic little place. Definitely stay again. Superb a little gem." Dougie and Kelly, Suffolk. "Perfect spot - clean, tidy and bright, and lovely sandy beaches. Excellent weather too!" Helen and John, Leicester. "Well appointed and clean, thank you both Roger and Alison for a comfortable stay. Good holiday in spite of the gail, but very warm in the cottage." Terry, Rose and Lisa Roosa, Norfolk. 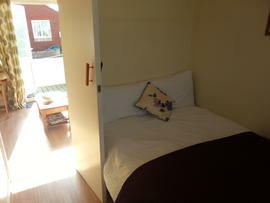 "Very clean cottage and comfortable bed. Friendly neighbours and a great opportunity to experience the daily life of English people." Len and Sandy, Queensland Australia.